Rajinikanth’s younger daughter Soundarya confirmed via Twitter post on Monday that she is getting married to actor businessman Vishagan Vanangamudi. The wedding is scheduled to take place in Chennai on February 11. Sharing a photo of herself all decked in traditional outfit, Soundarya wrote: “One week to go. Bride mode. Ved Vishagan Soundarya”. 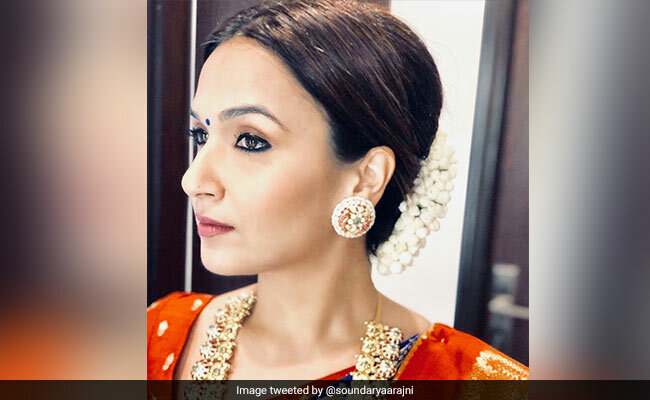 Before the confirmation came from Soundarya, several websites including The Times Of India and India Today, had reported that their wedding is scheduled to take place on February 11 and the pre-wedding functions will begin from February 9. It was also reported that before the wedding festivities begin, a puja will be held in Rajinikanth’s Chennai residence in Poes Garden. This will be Soundarya and Vishagan Vanangamudi’s second marriage. Soundarya was earlier married to businessman R Ashwin. Soundarya and R Ashwin are parents to three-year-old son Ved. Vishagan Vanangamudi was married to magazine editor Kanikha Kumaran. As a graphic designer, Soundarya Rajinikanth has worked on several films including ChandramukhiSivaji and Kochadaiiyaan. Her last film as a director was Velaiilla Pattadhari 2 or VIP 2, which featured her brother-in-law Dhanush and Bollywood actress Kajol. Soundarya Rajinikanth also announced her next project as a producer recently. The 34-year-old filmmaker is producing a web-series based on the historical novel Ponniyin Selvan. “From the day I read this amazing novel, I was determined to narrate this impeccable story in the visual medium and have explored every single avenue that offered the possibility to realize this vision. I am sure that the viewers will stay glued to this period drama,” she said in an interview to news agency IANS.